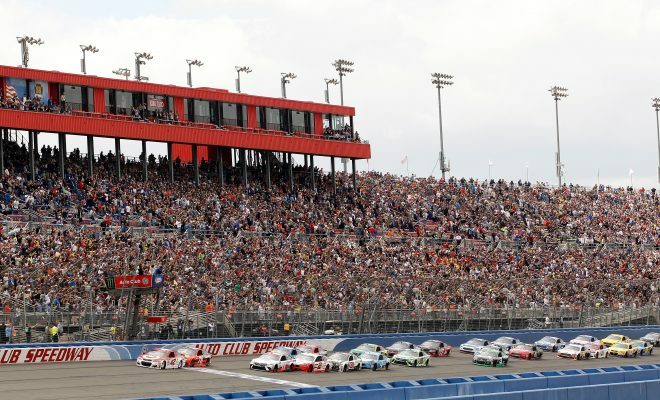 The Monster Energy NASCAR Cup Series is headed to Auto Club Speedway for the Auto Club 400 our Sarah Handy breaks down her picks and who you may want to pay attention to this weekend. Kyle Larson: The driver of the No. 42 Chevrolet for Chip Ganassi Racing won this race last season to claim his second career MENCS win. For a driver who has shown a lot of speed not only in qualifying but in the first four races this season, I believe Larson could walk away with the checkered flag this Sunday. It’s a track that is very similar to Michigan where Larson has also won and has been very successful during his young career. In four Cups starts at Auto Club Speedway Larson has an average start of 12.3 with an average finish of 17.0. However, as stated above he won this race last Spring and led 110 laps so look for him to be a serious contender. It’s only a matter of time before we see the 25-year old from Elk Grove, California in victory lane, he’s long overdue with how consistent he’s been each week. Kevin Harvick: The driver of the No. 4 Ford for Stewart-Hass Racing has been in my top picks the last two weeks, but honestly, how can anyone count him out right now? Harvick won his third race in a row when he captured the victory at ISM Raceway last Sunday. Harvick is already securely locked into the playoffs that will take place later this year and he will look to win four races in a row come Sunday. In 9 starts at his home track, Harvick has one win, three runner-up finishes and six top-ten finishes. The rest of the field has been chasing the California native for weeks now and I don’t look for that to change. While Larson is my top pick I look for Harvick to really make Larson work for the victory. Joey Logano: The driver of the No. 22 Ford for Penske Racing hasn’t been up front as consistently as we’ve been accustomed to seeing. While Logano has qualified well early into the season he seems to fall back in the running order. Logano has finished in the top-five in his last two starts at Auto Club Speedway and his highest finish in the MENCS of third came back in 2013. While it’s a track in the Cup Series that Logano hasn’t won at I look for him to spend his day in the top-five and contend for the win. With 1 top-five and 3 top-ten finishes in 2018 thus far he will find victory lane soon. Jimmie Johnson: The seven-time Champion who drives the No. 48 Chevrolet for Hendrick Motorsports hasn’t been having the season their use too. Heading to his home track Johnson leads all active drivers with six wins. However, he has yet to finish in the top-five, top-ten or lead any laps this season. It’s hard to fathom that Johnson’s best finishes heading into Sunday are a 12th place finish at Las Vegas Motor Speedway and a 14th place finish last Sunday at ISM Raceway. I debated having Johnson in my weekly picks at all, but the No. 48 team must find their mojo at some point this season and while a win will be difficult with their speed and how they’ve run Johnson could surprise everyone. This isn’t the first season that the team has started off in a slump, but usually their statistics aren’t quite so shocking. The El Cajon, California native last won at the track back in 2016 where he led 25 laps in route to the victory. He has an average start of 11.1 with an average finish of 7.13 to go along with 980 laps led. Brad Keselowski: The driver of the No. 2 Penske Ford has one win, one-runner up finish and one top-ten in his last three starts at Auto Club Speedway. The Fords have shown speed each week so look for Keselowski to have a decent run. He has one top-five, two top-ten finishes and has led 50 laps early in the season. Chase Elliott: It’s crazy to think that the driver of the No. 9 Chevrolet for Hendrick Motorsports has yet to win his first MENCS race. Elliott has been the best driver of the HMS camp so far this season. Elliott only has two starts at Auto Club Speedway but has finished in the top-ten both times. Heading into the fifth race of the season Elliott has one top-five and two top-ten finishes. I look for Elliott to be in serious contention for the win and spend the whole race towards the front of the pack. Who’s your pick to win at Auto Club Speedway this Sunday? Let us know in the comments below. The Auto Club 400 from Auto Club Speedway will take place on March 18 at 3:30pm EST and will air on Fox and be broadcast on MRN Radio. Another AWESOME article by Miss Sarah Handy. Love her insight and positive look at all the drivers.